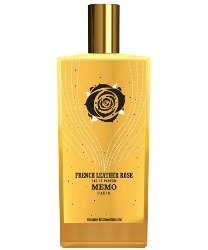 French niche line Memo has launched French Leather Rose, a new unisex fragrance. French Leather Rose is a flanker to 2014's French Leather. A stunning interpretation of the soft and sensual musk and pink pepper notes, MEMO’s French Leather Rose Eau De Parfum is deceptively casual, but not quite nonchalant – like leather that rises up beneath the rose. A sparkling accord, it captures the heart and soul of an intoxicating Paris – A sparkle in the eye. Style, even offhand. Having a table of choice in a favourite café. The smell of suede. Talent. Just one cigarette. Lime. Knowing how to combine opposites. The glimpse of a shoulder. Kissing. Memo French Leather Rose is available now at Harvey Nichols in the UK, £500 for 75 ml Eau de Parfum. Can’t wait to try this! I have French Leather. The lime note was the deciding factor in my choice. Adding rose into the mix sounds fantastic! French leather was already a rose scent, wasn’t it? Pretty sure it was…this one amps up some notes (and the price). £500 for 75? Eep. Going to the UK this month, but perhaps I shouldn’t sniff this at HN, as it’s about the same price as my airfare. Now, could someone please explain to me why Memo is allowed to charge 500 bloody pounds, that’s my rent by the way, to a 75ml perfume? What’s so special about it? Blonde virgins picking up the roses from the bushes after they moon bathed for 12 days and then more blonde virgins helping them to extract the essential oil, all of them chanting in Aramaic?? Their regular line is not this expensive, but they have done this series of “luxury” flankers.